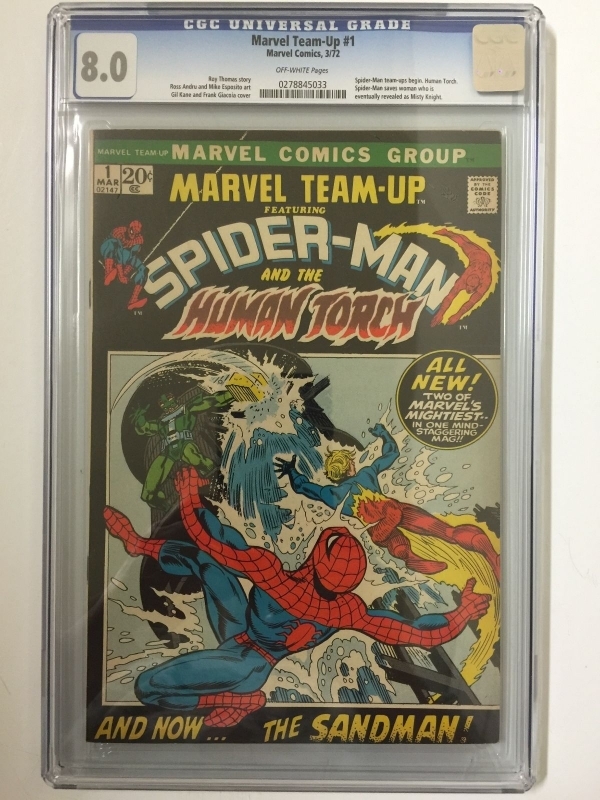 CGC 8.0 MARVEL TEAM-UP #1 .. SPIDER-MAN .. HUMAN TORCH ..
A GREAT COPY OF MARVEL TEAM-UP #1 CGC CERTIFIED 8.0 WITH OFF WHITE PAGES. SHIPPING IS FREE FOR ALL DOMESTIC ORDERS. 1ST SPIDER-MAN TEAM UP BOOK. 1ST MISTY KNIGHT. E-MAIL ME WITH ANY QUESTIONS. GOOD LUCK AND NO RESERVE. I SHIP VERY SECURELY IN A STURDY BOX WITH BUBBLE WRAP. ALL CGC CASES ARE IN PERFECT CONDITION UNLESS OTHERWISE NOTED. I AM A CGC AUTHORIZED DEALER AS WELL AS AN OVERSTREET ADVISOR. BUY AND BID WITH CONFIDENCE.